100 years ago this Sunday, 24 January, the Featherston Military Training Camp officially opened its doors to men from around the country. Ref: Auckland Weekly News, New Zealand's latest training centre for recruits, 10 February 1916, Sir George Grey Special Collections, Auckland Libraries, AWNS-19160210-43-1. As part of our ongoing commitment to the New Zealand’s First World War centenary commemorations Auckland Libraries have recently a digitised a small but important resource for understanding life in New Zealand during the First World War, specifically life in the Featherston Camp. In and around Featherston Camp by Sir Alfred Hamish Reed is a small volume written in a calligraphic hand with medieval-style ornate initials and illustrated with photos pasted on. Ref: AH Reed, In and around Featherston Camp, title page, c1917, Sir George Grey Special Collections, Auckland Libraries, NZMS 1827. In 2007 to commemorate 100 years, Reed Books published a reproduction of a similar book that AH Reed made for his wife Isabel about his time in Featherston Camp and his walks that he took whilst on leave from the Camp. First Walks in New Zealand, thought to be Reed’s first book, is mostly made of an account of Reed’s walk from Ohakune to Pipiriki during his Easter leave in 1917. It does include an account of the 24th Reinforcements’ ‘Long Trail over the hill’ to Trentham. In his autobiography Reed talks about the regret he felt at not being able to accompany his 21st Reinforcements on their walk from the Camp to Trentham. 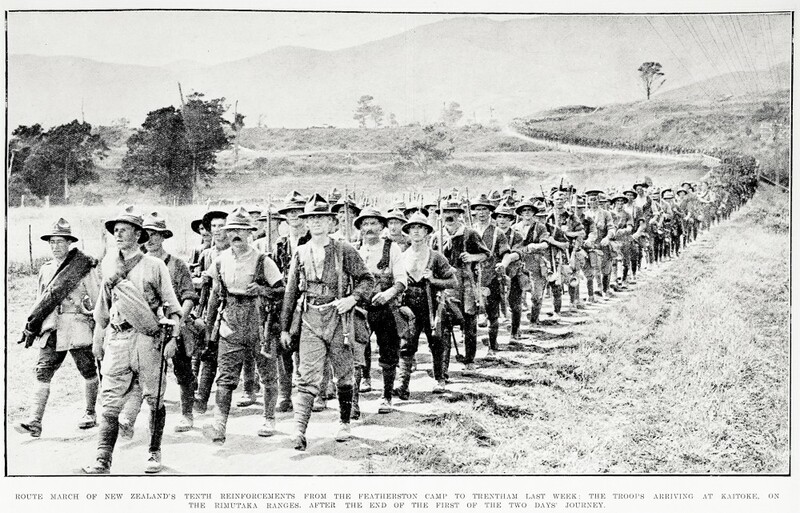 Ref: Auckland Weekly News, Route march of New Zealand's Tenth Reinforcements from the Featherston Camp to Trentham last week, 24 February 1916, Sir George Grey Special Collections, Auckland Libraries, AWNS-19160224-39-1. In and around Featherston Camp is much smaller (20 pages) and much more focussed on life in the camp but also describes the surrounds of the camp including the Tauherenikau River. 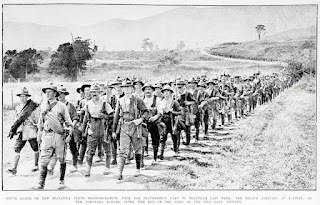 Intriguingly it includes this photograph of the 22nd Reinforcement marching into the camp, which could suggest that this was in fact the first book by AH Reed. Ref: AH Reed, In and around Featherston Camp, showing 22nd Reinforcements, p.17, c1917, Sir George Grey Special Collections, Auckland Libraries, NZMS 1827. Reed spent his time in the NZEF in Trentham and Featherston military camps where his shorthand skills gained him a position on headquarters staff. The article Reed contributed to the Camp Record, is entitled ‘A day and a night with the main guard: duties of the camp sentries’ which he describes as ‘the most honourable of the camp duties’. First Walks in New Zealand and this publication also include photographs and descriptions of the sentries. Ref: AH Reed, In and around Featherston Camp, showing Sentry, pp. 21/22, c1917, Sir George Grey Special Collections, Auckland Libraries, NZMS 1827. Reed gifted this early work to Hector Bolitho, who was the editor of Featherston camp weekly, the camp newspaper, which Reed also contributed to. Bolitho then presented it to Auckland Libraries in 1934.